Don't do as I do, but do as I say. Remember how these shills say it is amoral for a homeowner to walk away from their underwater mortgage? It looks like that is what MBA did. 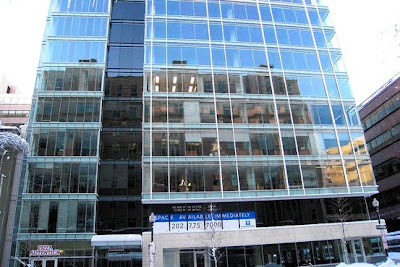 MBA bought this building for $79 million, and borrowed $75 million to pay for it. They now sold the building for $41.3 million. The CEO of the trade group, John Courson said, "We're not going to discuss the financing"
Mr. Courson said he believed under-water mortgage borrowers should keep paying their loans even if that no longer seemed to be in their economic interest. He said paying off a mortgage isn't only a matter of personal interest. Defaults hurt neighborhoods by lowering property values, Mr. Courson said. "What about the message they will send to their family and their kids and their friends?" he asked. What about Mr. Courson, the message this says to the world? How about it? You walk away, but you preach morality when its not your money or the company you head! How about it PNC? You lent him the money. What type of deal was worked out with your buddy? You just raised $3 billion last Wednesday selling stock to the public.You sold 55 million shares at $54. Now this mortgage is a state secret? If you took a $30 million hickey, its just 1% of the money you raised. So why is it that shareholders aren't entitled to know? They just gave you $3 billion, for gosh sake, and yet you get tell anybody if the head of the MBA walked away from a $30 million hickey, or the type of deal you cut with him? Why is it that a corporate owner, with hundreds of millions at stake, can just walk away, but a struggling homeowner can't get a loan modification or a break on his mortgage? Oh that's right. I forgot. Everyday for PNC is just another opportunity to do more to screw Joe SixPack, while you burnish your banker buddies shoes! Banks don't like that consumers have come around to join the ways of wall street banks and financiers. J6P has also come to understand that you do something like pay a mortgage only if its in your best interest, just like the banks. This point was not lost on the walkaways. Blogs abound with tales of such hypocrisy.